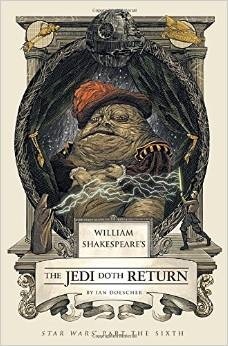 Ian Doescher’s final foray into the Original Trilogy, Shakespeare style, comes to us in the form of The Jedi Doth Return, and it may be the best of the three books. In the final chapter of the beloved saga, Doescher skilfully weaves the beloved story of Darth Vader’s redemption at the hands of his son in the style of iambic pentameter we have come to know and love from this wonderful series. Yet again, Doescher brings us another chapter of the Star Wars saga as Shakespeare may have woven the tale, and the only regret the reader may have is that Quirk books has not announced another in this groundbreaking series. As with the previous two books, William Shakespeare’s Star Wars and The Empire Striketh Back, Doescher finds creative ways to explore the unique patterns of speech found in the Original Trilogy; for example, he had Boba Fett write in prose (to represent the common man) in Empire, and in Jedi, we meet more characters that demand unique speech patterns to differentiate them. Salacious Crumb serves the role of Shakespeare’s fool in Jabba’s palace, and speaks in plain English to observe the action; the Rancor sings, and R2-D2 has a number of monologues that further illustrate how savvy the droid really is. Read it out loud, and you will see how charming and witty it truly is. The parallels are there for the Shakespeare aficionados, but are not essential to understanding the text. The reader’s knowledge of Return of the Jedi help put the toe of the Shakespearean novice in the water, and the poetry comes alive through Doescher’s craftsmanship. There are many more examples that could be shared here; suffice to say, the text is ripe with beautiful insights, clever dialogue, and soulful insights that leave the reader hoping for more of Ian Doescher’s take on the Star Wars universe in iambic pentameter. The ambiguous ending of the book makes one wonder what Doescher and Quirk books have in mind for the future, and it has been an absolute joy taking this journey. The seamless blending of William Shakespeare and George Lucas into one vision of language, storytelling, and character insights are among the peak experiences one may encounter in Star Wars literature. Let’s hope that Ian Doescher will return to that galaxy far, far away in the near future! I usually don’t read reviews before I read a book/see a film — I find too much is given away 😉 — but you have done a great job of just giving a hint of what to expect without going overboard. 🙂 I still have to read “The Empire Striketh Back”. 😉 I had better get crackin’!